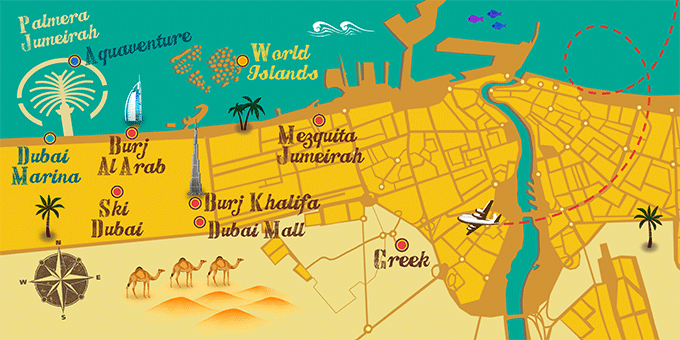 Known as a shopping paradise, the UAE has become synonymous with luxury and glamour. Its big cities, like Dubai, the streets are filled with typical souks where you can buy local merchandise, as well as large shopping centres where the most prestigious brands in the world are located. A paradise for lovers of shopping that has been crowned the best in the Middle East for being tax-free and because you can buy almost anything your heart desires here. The souks are open to haggling, as it follows the traditional Arab lifestyle. A popular shopping destination is the Gold Souk, where most of the jewellery shops are concentrated and where it is possible to find great discounts; as well as the Spice Market, which opens a whole range of possibilities for budding chefs. In large shopping centers, however, you can find outlets of clothing, electronics or accessories, as well as more prestigious stores. Its enormous variety has led to numerous shopping tours and in the city of Dubai, there is even the Shopping Festival, in which all products are discounted.